Dr. Andersen is a native of the Chicagoland area. Prior to her podiatric medical education, she obtained her undergraduate degree from Indiana University at Bloomington. She then attended the California College of Podiatric Medicine in San Francisco, California. She graduated as the President of her senior class, receiving the Outstanding Student Service Award at graduation. Dr. Andersen completed a three year advanced surgical residency at Stanford University Medical Center and DVAMC in Palo Alto, California. Following her training, she worked as a staff podiatrist at Santa Clara Valley Medical Center in San Jose, California, serving as the Associate Chief of Podiatry, as well as in private practice. 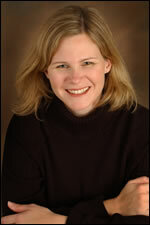 Dr. Andersen and her family moved to North Carolina in November of 1998. She worked in Durham until 2003, when she joined Chapel Hill Foot and Ankle Associates, P.A. She has surgical privileges at Durham Regional Hospital and Davis Ambulatory Surgical Center. She is Board Certified in Foot Surgery by the American Board of Podiatric Surgery. She enjoys seeing all types of patients including children, adults, athletes and the geriatric population. Dr. Andersen is the Past President of the American Association for Women Podiatrist, Inc. She is also a member of the Public Education and Information Committee of the American Podiatric Medical Association. She has been interviewed for and been featured in many magazine and newspapers articles including: USA Today; Oprah; Better Homes and Gardens; Fitness; Real Simple; Parenting; and Working Mother. She lives in Chapel Hill with her husband and two young daughters.